I really enjoy this series and can’t put my finger on what makes it so different. In this story, we’ve got our classing YA love triangle, but i’m not sure who i’m rooting for. This 2nd installment takes us on a few different paths, and the outcome is still kind of ambiguous to me (probably the reason that i’m loving it). So as the overview above states, Deuce finds herself in a place that she’s just not made for (or so she thinks). In the enclave, she was an adult, never had to answer to parents or teachers other than Silk and the Wordkeepers and that’s absolutely not how it is in Salvation. She’s also at a crossroads since Fade wants nothing to do with her and Stalker does, and Tegan’s an entirely different story since she keeps trying to make it seem as though everything that happened on the journey never happened. This means that there HAS to be trouble brewing outside their little world since they are so involved in this story line right? Well, that’s exactly what we get. While we’re led to believe that the Freaks (or Muties) are primitive and without the ability to plan and develop strategy and think on their own, we learn that evolution is taking place and things are going to be flipped faster than we know it. Some of the secondary characters in also begin to be more important here which is nice. Longshot not only has a soft side for Deuce, but he really believes in her. Through this book we learn a bit more and see where their relationship will take them. we also see more from Momma Oakes and Edmund which is nice since Deuce needs someone to be a parent and these 2 are PERFECT for the job. 1) What is Longshot asking Deuce to do and what will come of that? 3) What’s happening outside the walls of Salvation and how long will those walls hold up? 4) what is it that the Freaks really want? 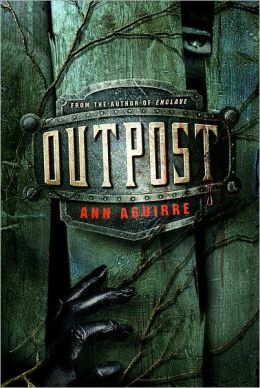 This entry was posted in Dystopian, fantasy, Reviews and tagged Ann Aguirre, Dystopian, Enclave, Endurance, Outpost by iscm13. Bookmark the permalink.